Reserve discount Arizona tee times up to 120 days in advance! Click here to book your tee times online now. 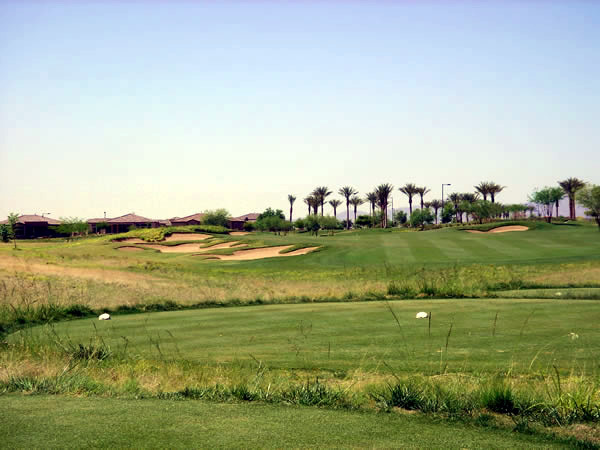 We will custom design an Arizona golf vacation for you. Get your FREE Arizona golf package quote now. Designed by golf course architect Gary Panks, the championship Trilogy Golf Club at Vistancia takes upon distinctive land features along with stunning Arizona views that set in the backdrop. The Trilogy Golf Club at Vistancia features more than 70 strategically placed bunkers, that feed gently into the golf course's fairways and native areas. The course highly rewards careful planning and precise execution by the golfer. There are five different tee boxes from which to choose on this unique 18-hole, par 72-championship golf course. Tees range from 5,573 yards to 7,259 yards, allowing players of every skill level to enjoy this exceptional test of Arizona golf. From Phoenix Sky Harbor: Follow signs for the I-10 W. Freeway. Merge onto I-10 W. and continue 5 miles. Merge onto I-17 N. via exit 143A towards Flagstaff and continue 14.3 miles. Take the Loop 101 W. exit via exit #214C. Merge onto Loop 101 W. and continue 5 miles. Exit 75th Ave via exit #17. Turn right onto 75th Ave. Turn left onto Deer Valley Rd. Turn right onto 83rd Ave. Turn left onto Pinnacle Peak Rd. Turn right onto Lake Pleasant Rd. Turn left onto Happy Valley Rd. which becomes Vistancia Blvd. Turn left on Trilogy Blvd. Course is located on the left hand side of the road. © Copyright LMA Golf Inc., 2007- . All rights reserved.